To promote our drilling mud treatment and disposal equipments,we are looking for agents around world.This way we will also offer better local service to our international drilling mud treatment equipments customer. Thanks for your interst in our drilling mud treatment equipments. Our equipments and systems are widely used in oil gas drilling fluids mud disposal and treatment. 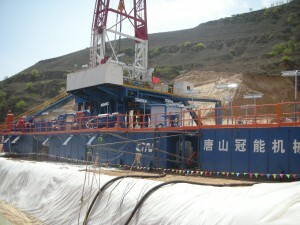 We are very interested in your proposition,and actually as you know,the drilling mud treatment equipments and systems are big deals,we do need local people to help us communicate with our international customers.And from your introduction of your company,we see you would be good at marketing our products in Syria.That would be great. But you know,we need to understand each other better,so we recommend we do one regular deal first.,after that it would be the right time for us to get into agent,or sole agent in your country. Drilling fluids treatment system, Shale Shaker, Mud cleaner, Hydrocyclone(Desander & Desilter),Decanting Centrifuge,Vacuum degasser,Sand pump,Gas-liquid Separator,Jet Mud Mixer,Mud Agitator, Shear Pump,Submersible slurry pump, Electric Ignition Device ,Mud Gun, Mud Tank,Mixed-hopper, series solid control equipment and the drilling fluid circulation system for oil gas drilling, the products are widely used in petroleum oil and gas exploration industry, no-dig engineering, geotechnical engineering, mine, metallurgy, coal, hydropower and many other industries.GN solids control products can be used in both onshore and offshore oilfield project. For further info,pls let us know.And we are looking forward to our progress. Awaiting your comments.And looking forward to getting into drilling mud treatment equipments business. Please contact me at 239-398-3929. I am looking for a company that is welling to go into partnership in Libya and expert in the process and equipment of water based drill mud treatment This should be done in a way that dose not harm the environment. Can you do that?